1. PDP president Mehbooba Mufti Monday accused the BJP of creating a fear psychosis under the guise of national security to prepare for another Balakot-like strike in desperation to win Lok Sabha elections. 2. Leader of Opposition in the Rajya Sabha Ghulam Nabi Azad Monday claimed the NDA government has a "poor record" in dealing with terrorism and national security, while accusing Prime Minister Narendra Modi of trying to "mislead the nation" regarding Congress' stand on these issues. 3. A day after Prime Minister Narendra Modi accused the Abdullahs and Muftis of trying to break the country, National Conference president Farooq Abdullah Monday retorted back, saying if his family wanted to break India, "there would have been no India". 4. As many as 19 passengers, including eight women, exchanged sides as the weekly cross-LoC bus service resumed on Monday after remaining suspended for the past two weeks owing to heavy shelling along the Line of Control (LoC) in Poonch district of Jammu and Kashmir. 5. BJP national vice president Avinash Rai Khanna met Governor Satya Pal Malik Monday and appraised him about the prevailing situation in Kishtwar district following the killing of RSS leader Chanderkant Sharma. 6. Technology was on India's side in the Balakot air strikes, Air Chief Marshal B S Dhanoa said on Monday, asserting that the results would have been further tilted in the country's favour if Rafale jets were inducted in time. 7. Legendary singer Lata Mangeshkar Monday pledged to give Rs 1 crore to the families of the Pulwama martyrs. 8. Amid the uncertainty over an alliance between the Aam Aadmi Party (AAP) and the Congress in the Lok Sabha polls, Rahul Gandhi tweeted on Monday that a tie-up between the two parties would rout the BJP and offered four of Delhi's seven Lok Sabha seats to AAP. 9. A colossal fire swept through the famed Notre-Dame Cathedral in central Paris on Monday, causing a spire to collapse and raising fears over the future of the nearly millenium old building and its precious artworks. 10. Prodded by the Supreme Court to take prompt action against political leaders who cross the line, the Election Commission on Monday banned Samajwadi Party's Azam Khan from campaigning for 72 hours. Union Minister Maneka Gandhi has also been barred from campaigning for 48 hours. 11. The Board of Control for Cricket in India's (BCCI) panel of selectors on Monday announced the 15-member squad for the ICC World Cup to be led by Virat Kohli. 12. The Council on Foreign Relations (CFR), a leading US think tank on foreign policy, has graded President Donald Trump's handling of ties with India as one of his successes, along with his dealings with China and Saudi Arabia, and his efforts to normalize relations with North Korea. 13. The traffic on the strategic Jammu-Srinagar National Highway resumed after remaining suspended for over seven hours due to a massive landslide in Ramban district Monday. 14. Five days after an issuance of notification by the Election Commission for the Ladakh parliamentary constituency, Congress candidate Rigzin Spalbar Monday filed his nomination papers from the seat, which is going to polls on May 6. 15. 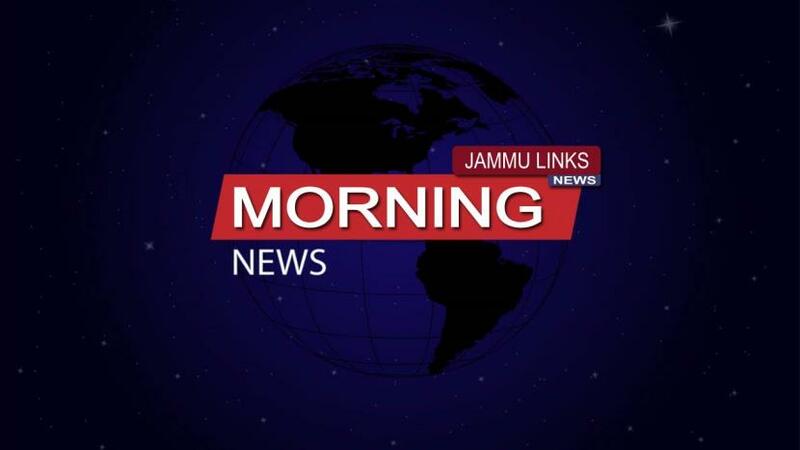 A few youngsters Monday hurled stones on PDP president Mehbooba Mufti's carcade while she was electioneering in South Kashmir's Khiram area, leaving her security guard injured. 16. Finance Minister Arun Jaitley Monday rejected the opposition's argument that elections should not be fought on national security issues, saying security and terrorism are the most important issues in long run while all other challenges are capable of early resolution. 17. Mobile internet services in curfew-bound Kishtwar township of Jammu and Kashmir was restored on Monday after remaining suspended for the past six days following improvement in the overall law and order situation. 18. The India Meteorological Department (IMD) has predicted "near normal" southwest monsoon rainfall this year, even as it downplayed the impact of the El Nino weather phenomenon. 19. The Election Commission of India (ECI) was asked by the Supreme Court on Monday to re-examine its earlier order that banned the screening of biopic on Prime Minister Narendra Modi after watching the full movie. 20. Jet Airways Monday said its services on overseas routes will remain grounded until April 18, even as the lenders failed to take a call on extending an emergency funding to the airline.